Okay, here's a quick post to my kababayans in Roxas City and Capiz. In answer to the increasing number of unemployed due to the recent global recession, the Roxas City and Capiz provincial governments are holding a job fair today at the Roxas City Civic Center. This is in line with the nationwide effort of the national government to help the unemployed find jobs. Started only last year, thousands of job-seekers have joined the fair and, according to reports, over one thousand have been employed overseas and more than four thousand were employed locally. Today is the fourth time that a job fair is held. It started at 8am today and ends at 5pm later this afternoon. Job-seekers are asked to bring with them documents such as their resume, diploma, and transcript of records. I am not sure as to what kind of job are available but, just the same, why not show up there to see? Who knows, ato lang gali didto gahulat ang trabaho sa imo. "Look, Ma... I'm like a puppet in strings!" My precocious marionette. His hospital room became an extension of his playground. We rushed him to the hospital after two days of severe headaches. 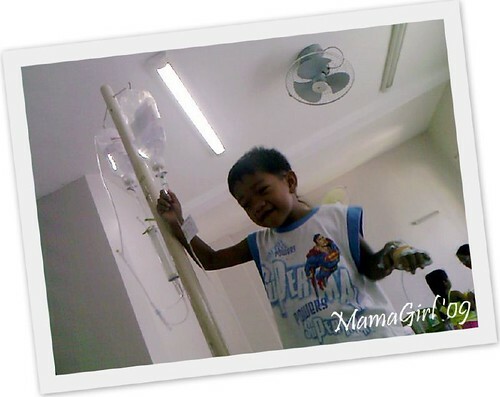 After seeing a pediatric-neurologist and undergoing CT scan, the headaches disappeared and he was bouncing like a ball. We stayed 3 days as he was still under observation, and when we got the go-signal from the doctors, we were happy and relieved that nothing is wrong. Total expense, P32K, that's roughly US$800! But he is healthy and we are not worried anymore. ... to my blogger-friends whose links I lost when I changed my template. Kindly leave me your URL addresses in my comment or shout boxes and I'll be glad to put them back to the list. This photo was taken while we were travelling to Olotayan island. Olotayan is the sole coastal barangay of Roxas City, a 45minutes travel by boat from the city. 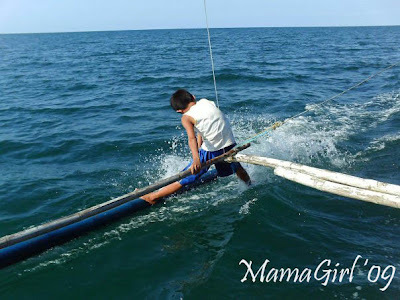 I was so amazed seeing this brave kid, playing at the "katig" (outrigger) while the boat is clashing against waves in the middle of an open sea. I don't think i can do that... can you? Hello friends. Just so you all know, I am still here busy. I am currently undergoing a training with an international organization for a future job. As you all know, our organization has no longer enough funds to support its projects and so it is closing down some projects and several staffs were laid off. We all had the option to re-apply, but I decided to leave. So now, I am in Manila for the training. Sang Huwebes pa ako diri. I left my son to the care of my parents and in-laws. It's difficult as 5 days is a long time to be away from my son and I am afraid he'd miss me. Anyways, thanks to my donors, my siblings who continue to support me, I flew to Manila ahead of the scheduled training. I decided to come a day earlier so I could have my medical check up at Saint Luke's Hospital earlier. 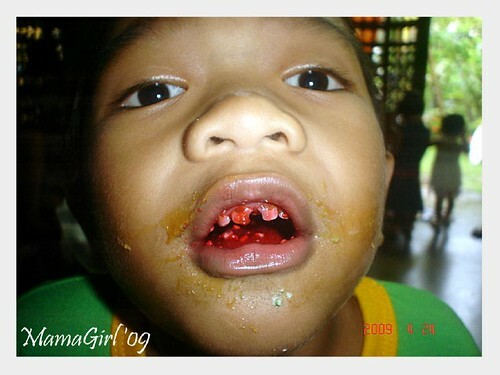 The medical check up is a requirement and being so, is paid for by the organization. On Sunday afternoon, I'll be returning for blood works. So, this is all for now. Will tell you more when I return to Roxas. Break time is short as the sessions are intensive. Lots of learnings, I'm glad, to prepare us for the change that we all are about to embark. So, till then.